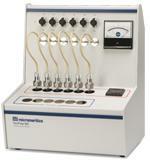 The VacPrep Degasser prepares samples for surface area and pore structure analysis. Like Micromeritics' FlowPrep Degasser, the VacPrep provides a simple, easy-to-use method of preparing samples using the flowing gas method. In addition, the VacPrep offers a vacuum mode which prepares samples by heating and evacuation. The VacPrep thus offers two methods for removing contaminants such as water vapor and adsorbed gases from samples to avoid interference with surface area measurements. The VacPrep features six degassing stations, and a choice of vacuum or gas flow preparation on each of the six stations. This combination allows you to choose the preparation method that is best suited to your material and application. With the VacPrep, contamination of sample during transfer from the degas-to-analysis process is minimized. This greatly enhances reliability of operation and increases precision of results. The VacPrep lets you choose the temperature and preparation technique best suited to your sample and application.